Mobile broadband is an easy way of getting online when you’re on the move, allowing you do everything you would on a home connection — like sending e-mails, browsing the internet and even streaming video and music — wherever you are. The arrival of 4G services in most of the UK means that mobile broadband is now faster than ever, making mobile internet an even more viable alternative to a fixed line connection. As the name suggests, mobile broadband is a service you can connect to on the go. Mobile broadband gives you access to the internet on a laptop computer wherever there's a mobile phone signal. Mobile broadband is accessed using mobile phone networks, either 3G or 4G, which means you can connect wherever there's 3G or 4G coverage in the UK and abroad and get on the internet at the touch of a button. 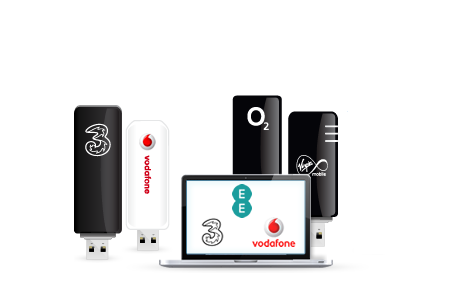 Mobile broadband is accessed using a dongle, USB modem or MiFi. Simply plug one of these mobile broadband modems into your computer or connect wirelessly with a MiFi and you can instantly access the internet. The fact that mobile broadband is designed for laptops doesn't mean it can't be used by PC owners; in fact, if you're looking to sign up to home broadband but don't have a BT landline or don't want to pay the home phone connection fees, mobile broadband could be perfect for you. You can choose between pay as you go, contract or SIM-only short-term rolling contracts of one month. It really couldn't be easier or faster to set up a mobile broadband connection. Once your new mobile broadband dongle has arrived, simply insert the USB modem into one of the USB ports on your laptop or PC (it shouldn't matter which USB port you choose) and it will begin installing the software you need to get online. This means that everything you need for your mobile broadband connection is on the USB stick. Better yet, the stick is powered by your computer, so doesn’t require an external power cable. 3G vs 4G: What's the difference? 3G stands for third-generation and has been the UK's mobile broadband standard for some years. 4G, which is short for fourth-generation, is a newer mobile technology. 4G is capable of delivering mobile broadband connections speeds up to five times faster than 3G — but 4G networks aren't available everywhere just yet. 3G is slower but has the advantage of being much, much more widely available. Even if you have a 4G mobile broadband plan, you'll probably be connected to 3G more frequently than 4G. Who is mobile broadband for? Businesses: Instead of using a tiny phone screen, you can use mobile broadband with your laptop to prepare for presentations on the train or access your VPN while on business trips. Students: Use the internet when you're travelling home for the holidays, on the train, coach or even just in the park with your friends. Travellers: If you spend a lot of time on the go, then mobile broadband is a must-have. With mobile broadband you can take your laptop anywhere in the UK or abroad and get access to high-speed internet. Really, mobile broadband is for anyone who wants anytime, anywhere broadband access. Maybe you just want to know that wherever you are, you have the flexibility to open your laptop and access your e-mails, or use all the online applications you would normally use in the office or at home. If that sounds like you, then mobile broadband is exactly what you've been looking for. Mobile broadband ISPs have realised that there's a huge number of business people out there who are keen to make the most of mobile broadband technologies and save time in their day. Dedicated business mobile broadband packages are now on offer from a range of ISPs. Compare all business mobile broadband deals on our dedicated page. There are a number of factors to take into account when choosing your mobile broadband package, and what may be considered the best mobile broadband for one person may not be for another. Price: This is something that features near the top of everybody's checklist, but it’s not the only thing to consider. When it comes to mobile broadband packages you may find that by spending an extra £5, you'll massively boost your download allowance and get more value for your outlay. Mobile broadband download speed: Although 4G is fairly standard for most mobile broadband packages, not all providers offer the same speed. Mobile broadband download allowance: Choosing a mobile broadband package with the right download allowance for your requirements is really important. You'll find that the charges for going over your download allowance can really bump up your bill. Mobile broadband contract length: Different providers have different options, ranging from pay-as-you-go and SIM-only deals to 24-month contracts. Mobile broadband USB modem: Choosing a mobile broadband modem will largely come down to the package you opt for. Some providers offer small dongles while others give you a MiFi unit instead. Mobile broadband coverage: Much like the quality of calls, the standard and speed of that connection will be determined by your location and your provider's coverage. If you live in an area that you have found to have bad mobile phone coverage, it could be worth sticking with a provider you know has strong coverage in your area. Mobile broadband vs Wi-Fi broadband: What's the difference? Although the two may seem similar, they're actually quite different. Wi-Fi is restricted to small areas and hotspots, whereas mobile broadband is accessible anywhere there's mobile phone coverage. More and more retailers, restaurants, transportation providers and other places are offering Wi-Fi, but relying on Wi-Fi doesn't offer the same freedom or guarantee as using mobile broadband. A number of security concerns have also been raised in relation to public Wi-Fi signals, with hackers using open networks to steal data and sensitive information. Since it's not a public connection, mobile broadband is a more secure way to access the internet on the go. That being said, combining mobile broadband with a Wi-Fi hotspot — since most mobile broadband providers also give free access to Wi-Fi hotspots — is a great way to boost your speeds. Just be careful with the type of information or data you're accessing on public networks. Depending on a number of factors, mobile broadband coverage varies. In order to check whether there's mobile broadband coverage in the area you'll be connecting, click on the providers' websites and perform a street check. The main factor affecting mobile broadband coverage is the distance from the mobile phone mast. The closer you are to it, the faster speeds you will be able to get. This applies for both 3G and 4G mobile broadband. With mobile broadband you can take your USB stick/USB dongle with you when you go abroad and connect to the internet with ease. Overseas usage comes at a cost, as you might expect, although these costs depend on the carrier you are with and are cheaper than you might think nowadays, especially if you're traveling in Europe. For more information on using broadband abroad, see our guide on accessing broadband abroad.